A new set of fireplace tools brings both style and utility to your hearth. Here are a few guidelines that will help you select the right set for you. First, choose tools that are the right height your fireplace. 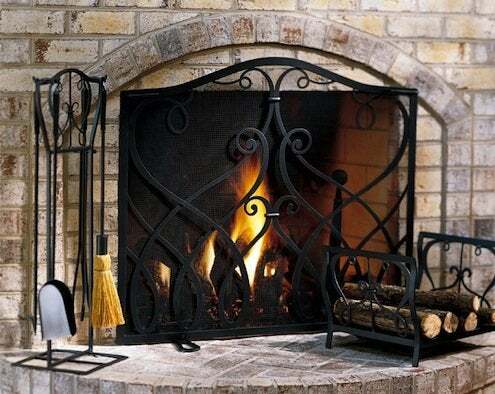 Tool sets that are 26 to 30 inches tall are appropriate for most standard fireplaces. “Mini” sets range from 22 to 25 inches in height and are perfect for wood stoves. Taller sets are available for those grand, scene-setting hearths. Most sets include a stand and a minimum of three tools: a poker for adjusting the logs, and a shovel and A broom or brush for cleanup. Many sets also include a pair of tongs, useful for stoking the fire or moving logs. Quality counts: make sure the tools are sturdy with firmly attached handles. Insulated handles are a nice extra, but expect to pay more. The stand should hold the tools securely and not tip over when you remove one. You’ll find scores of styles online, from whimsical to austere, in lots of different materials and finishes. Check out a few brick-and-mortar stores too: there’s no substitute for holding a tool in your hand to get a sense of its quality and durability.